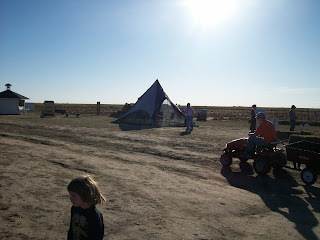 We took a trip to the Pumpkin Patch near Sublette, KS just before Halloween. Yes, I know I'm a little behind....story of my life! Anyhoo, I have never seen so many different types of pumpkins! They had white, black(! ), yellow, several shades of orange(duh), and a bunch others that I just can't remember at the moment. They also grew squashes, gourds, cantalope, and watermelons. and we even encountered some of the locals. Honestly, I forgot how damn big cows are! This is a shot Gene took of us watching the catapult. The man had this huge well, catapult, that he flung watermelons several hundred feet.